Shell Deer Park: One team, one mission. 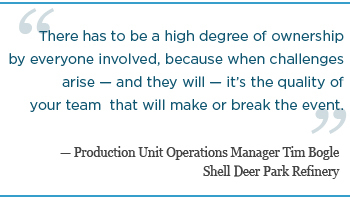 Everything about the turnaround on Shell Deer Park Refinery's Maya II Coker unit was big. From the TC-36000 crane nicknamed "Big Red" to the 314-ton derrick and the two new coke drums, each of which weighed 1.1 million pounds and measured 18 inches larger in diameter than those replaced. Preparation of the haul road and drum staging areas required moving 20,000 tons of dirt, and during a 12-day period of the turnaround the project team supervised the safe lifting of over 6 million pounds. One of the 10 largest refineries in the U.S., the Shell Deer Park Refinery is a fully integrated oil, gas and petrochemical facility. Its delayed coker units - Maya I and Maya II - process approximately 85,000 barrels a day through six drums. The Maya II planned outage meant a loss of approximately 28,500 barrels a day, or more than 1.2 million total barrels of throughput, making timing and execution critical. The turnaround was logistically and mechanically complex, and its compressed timeline demanded work phases be overlapped. New coke drums had to be procured, fabricated and shipped. That process alone was estimated at 18 months and, if the timeline was to be maintained, required deviation from standard procedures that otherwise would have required the Financial Investment Decision to have first been made. While the drums were being fabricated and shipped, the receiving dock at the refinery would also have to be modified to allow for offloading, staging and insulation before installation. Photogrammetry (a technology adopted from NASA that involves high-resolution, high-accuracy dimensional measurements) of Maya II would be needed to identify required modifications to allow for the larger radius of the new drums, and higher-resolution scans would also be required to ensure critical fit-up on installation. The photogrammetry would also provide the leadership team with pre-outage visualization to study the work to be done, almost as if performing a "virtual outage." Extensive structural steel and piping modifications would be required to accommodate the new larger drums, and grating and floor plate would need to be cut and replaced before the new, larger drums were installed. The bottom two Delta Valves from the second level of the structure, as well as the top two Delta Valves from the sixth level of the structure, would also need to be removed to allow for modification of the cutting water line for derrick removal and installation of two new 2,500-pound flanges due to line erosion. And finally, any issues that might impact the safe removal of the derrick and two old drums needed to be identified and resolved. Because the cost of work completed during an outage can be twice that performed on the run, the objective was to complete as much of the work as possible during the pre-turnaround phase before the start of the outage, while Maya II was still operational. Doing so required clear communication and lock-step coordination with Maya II operations personnel to safely perform hot work on the live Maya II unit between coke-cutting cycles on the two drums. 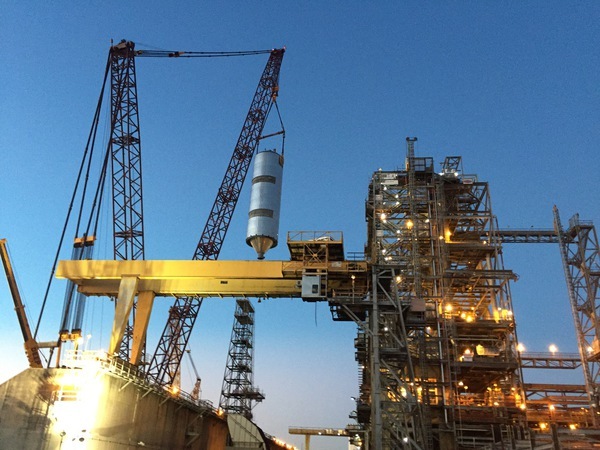 Shell knew successful project execution would require precise choreography, communication and collaborative efforts from the select phase through completion, and they would need a tightly integrated team of maintenance professionals that mirrored the leadership and quality of their own on-site team. "One of the main reasons any turnaround fails is because of lack of communication and integration from one phase of the project to another and across the entire team," said Shell's Site Turnaround Manager Wes Carambat. Shell's Production Unit Operations Manager Tim Bogle agreed. "You have to make sure your team has the right players and the right skill sets," he said. "There has to be a high degree of ownership by everyone involved because when challenges arise - and they will - it's the quality of your team that will make or break the event." 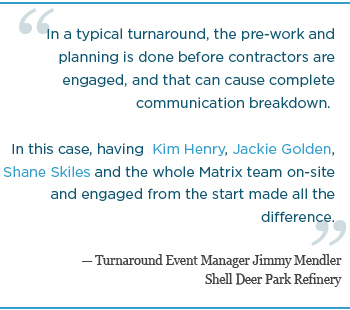 For the heart of the event - the mechanical and turnaround services - Shell found the team they needed in Matrix Service, a subsidiary of Matrix Service Co. (NASDAQ:MTRX). Matrix possesses more than 30 years of expertise in providing mechanical and turnaround services and had recently completed a highly successful FCCU turnaround for the Shell Puget Sound Refinery in Anacortes, Washington, something Carambat said was key in Shell's decision to hire Matrix for the Maya II event. "The leadership, quality and care for their craftspeople matched our own," he said. "Matrix looks for solutions to move forward even when things are difficult. That spirit of innovation and 'no barriers' approach is what our own team exhibits every day, and it's what we expect." The Matrix leadership team that executed the work had also been part of the 2007 Maya I turnaround, which was similar in scope to that planned for Maya II. 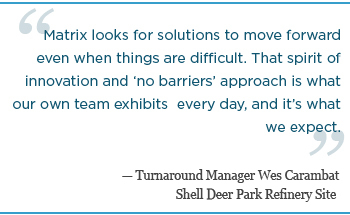 That experience, explained Shell's Turnaround Event Manager Jimmy Mendler, was invaluable. "The familiarity Matrix already had with this specific refinery, as well as lessons learned in the Maya I turnaround, were key to our success," he said. "They were able to offer knowledge from day one about what went well, what could have gone better and how we might approach specific situations differently." While Matrix held responsibility for the mechanical and turnaround services, the project also required support from a host of other contractors for front-end engineering, drum fabrication, overseas transportation, heavy lifts and on-site drum transportation, scaffolding, crane and rigging support, electrical and instrumentation, event supervision support, support cranes and more. It wasn't long before Matrix and others were fully integrated and entrenched in the project. According to Shell Project Engineer Adam Lecompte, the select phase of the project began in February 2014. Just seven months later, key mechanical and turnaround leadership was on-site. "We launched constructability reviews with Matrix and others long before we had a Final Investment Decision or finalization of the Piping and Instrumentation Diagrams and Data Sheets," Lecompte said. "By bringing everyone into the process early, we were able to plan and schedule more efficiently so we could complete as much work as possible outside of the outage. 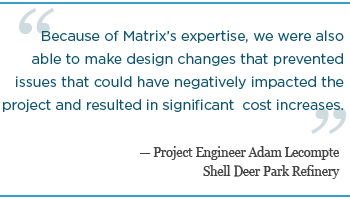 Because of Matrix's expertise, we were also able to make design changes that prevented issues that could have negatively impacted the project and resulted in significant cost increases." Case in point: During one of the detailed constructability reviews, thermal fatigue lines and the resulting fragility in the existing drums, each of which weighed 445 tons (890,000 pounds), raised significant concern about their safe removal. "If we weren't able to keep the existing drums in compression, the drums could have fractured and, if the drums fractured, the energy released by an uncontrolled fall might have flipped the crane," said Lecompte. "The expertise Matrix brought from prior experience, as well as our constructability reviews, allowed us to design and fabricate specialized lifting devices that minimized tension on the drums as they were taken from a vertical to horizontal position. Doing so prevented their release and allowed the drums to be safely removed." By inviting key leadership into the process on the front end, Shell took team integration to a new level. Lecompte explained that had they not done so, the outcome in this instance, as well as the overall turnaround, may have been quite different. Mendler agreed. "In a typical turnaround, the pre-work and planning is done before contractors are engaged, and that can cause complete communication breakdown," he said. 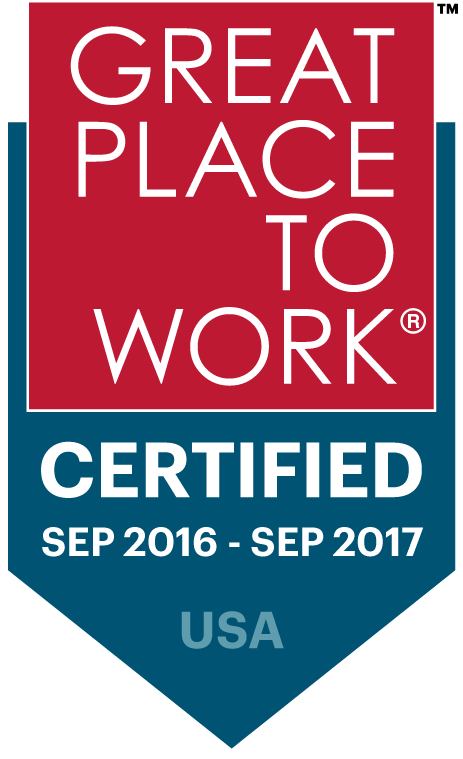 "In this case, having Kim Henry, Jackie Golden, Shane Skiles and the whole Matrix team on-site and engaged from the start made all the difference." But engaging the team in detailed constructability reviews was just one part of building a single team focused on a single mission. Breaking down barriers, building relationships. Incorporating "rookie day" into the standard on-boarding process also took team integration to a higher level. "The idea was if we could get to know each other beyond job titles and employer, we could break down any natural barriers people might have to become one team," said Mendler. "If we had stayed in silos, we wouldn't have been successful." Mendler said they borrowed the idea from professional football, where team members review safety standards, rules and expectations, but also spend time sharing more about their personal lives as well. "Our goal was to get everyone actively engaged from day one. If you can put a name with a face and know more about someone, it just naturally improves productivity because you see the person, not the position; you know where he or she grew up, for example," he said. In this case, the team learned they had a former professional baseball player on the team, another who had donated a kidney to his grandfather and another who had been a rancher for half of her life. Because of the timing of the event, team members spent holidays together, and, although they might have worked for different employers, they came to know each other as people. "We genuinely cared for each other first, and that care was reflected in a successful event. We were all here to do a job, provide for our families and get home safely," Bogle said. "There was no 'us versus them.' If we had an issue, we all owned it, and it was the team's issue to resolve." With little room to work and zero room for error, the entire project took two years from the select phase through completion. Working round the clock, the team finished their work two days earlier than planned and did so with zero recordable incidents. "I can't count the number of turnarounds I've been a part of in the last 21 years, both as an operator and now as a production operations manager," said Bogle. "And no matter how a turnaround goes, you always remember how it made you feel. On this turnaround, it was a feeling of complete success. The energy and the way it felt - the comradery and the way we all functioned as a team - is irreplaceable." Carambat agreed. "Start to finish, it was impossible to identify where project planning ended and the turnaround event began. It was seamless, and when you can accomplish that, it's gold," he said. "Matrix and the entire team did an incredible job." For more information about Matrix Service Co. and its subsidiaries, Matrix Service, Matrix NAC, Matrix PDM Engineering and Matrix Applied Technologies, visit www.matrixservicecompany.com, call 918 838 8822 or email us. This article first appeared in the October 2016 edition of BIC Magazine.